CLRA is committed to bringing an end to Childhood Leukemia. Through research we can find the answers. The following list of promising past and present research grants show our commitment to finding the answers. Research is the key to a cure...and we are so close. 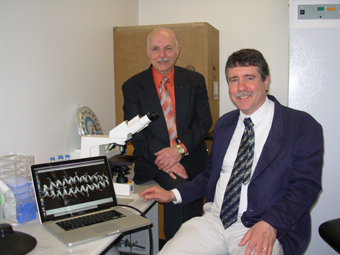 Dr. Jerry Brown, gives a tutorial in the use of the electronic microscope to Anthony R. Pasqua, President of Children's Leukemia Research Association Inc. at Rosenstiel Basic Medical Sciences Research Center, at Brandeis University. 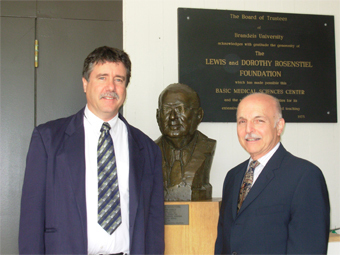 Anthony R. Pasqua, President, Children's Leukemia Research Association Inc. and Dr. Jerry Brown, stand before the bronze sculpture dedicated to Lewis Rosenstiel for his generosity in making possible the Basic Medical Science Center at Brandeis University. Anthony Pasqua, President of the Children’s Leukemia Research Association Inc. tours the lab of the world famous Dana Farber Cancer Institute along with his daughter, Susan (Pasqua) Kerwin who was diagnosed with AML in January 1980 (at the age of 5). Susan received a Bone Marrow donation from her brother, Michael and is cured. Also, with Mr. Pasqua is his son, Michael, who in 2003 was diagnosed with Non-Hodgkin’s Lymphoma. Michael’s treatment was chemotherapy and radiation and he is in total remission. He currently works as a Medical Assistant at NCH Medical Facility in Naples, Florida. Standing with the Pasqua family are two scholars who have received funding from Children’s Leukemia Research Association—Dr. Takaomi Sanda and Dr. Jennifer Trowbridge. 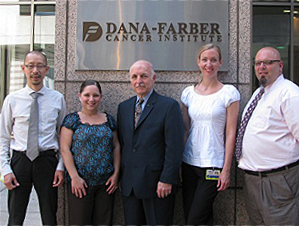 Both scholars are on the staff of the Dana Farber Cancer Institute.